The horses are ready at the starting line. The jockeys are sitting nervously. The crowd is waiting with baited breath…and then – BANG – They’re off! But this is no ordinary horse race. It’s crazy. It’s hilarious. It’s full of surprises. In fact, it’s EPIC! A new picture book for kids has been released that feeds off Australia’s national obsession with the horse race, just in time for Spring Racing Season. The Epic Race is a children’s picture book about a very unusual, side-splitting horse race. 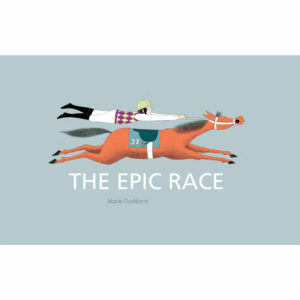 Published by Melbourne-based, independent publisher Wilkins Farago, a of children’s picture books from around the world, The Epic Race captures the love of a big race. ‘Sometimes you pick up a book and laugh so much, you have to make other people read it too,’ says Andrew Wilkins, Director of Wilkins Farago. ‘It’s about a horse race with a difference. It’s chaotic, whacky and full of surprises. From the moment the starter’s gun fires, the book combines all the spectacle and thrills of a great horse race with as much silliness as you could possibly imagine. Nothing happens as expected and the biggest surprise of all will be the lone winner—a jockey carrying his mount! The Epic Race joins an exclusive list of acclaimed and award-winning international children’s picture books published by Wilkins Farago. The Epic Race is a hardcover children’s picture book comprising 32 full-colour pages of colourful, eye catching illustrations. It is ideal for early to early-to-primary school aged children. It is available for sale from book shops throughout Australia or online at www.wilkinsfarago.com.au. Notes for teachers and parents are also available on the Wilkins Farago website. Marie Dorléans is a member of an exciting new wave of French authors and illustrators whose imagination illuminates everyday life. A graduate of the Arts Déco in Strasbourg, France, Dorléans won the City of Nanterre Award for the Picture Book of the Year in 2014. The Epic Race is her third children’s book and the first to be published in English.